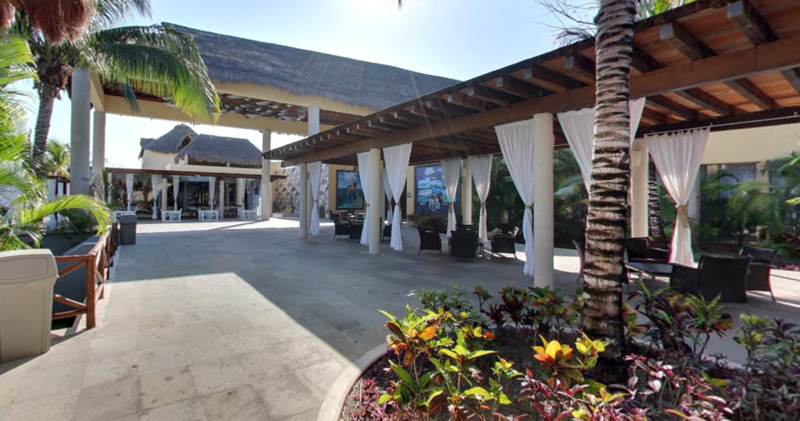 In our last article, I provided a guide on how to get to Dolphinaris Riviera Maya. Now, let’s delve in deeper into my time as I got the once-in-a-lifetime opportunity to swim with Dolphins in Riviera Maya at Dolphinaris. After I arrived I parked my car and walked through the entrance. I was immediately greeted by a friendly staff. They welcomed me with the sort of warm and outgoing customer service that is so typical of the Riviera Maya. They then began evaluating my itinerary. They gave me a key to a locker, towel, life-jacket and t-shirt. I was escorted to the lounge and was told we would be starting in about 15-20 minutes. The lounge area had everything you needed to pass the time. There was a foosball, ping-pong, and air hockey table for your leisure. They had a bar and restaurant right next to the game tables. I was told my dolphin-trainer-for-a-day package included free drinks and food. And of course, there was a private pool from which you could observe the dolphins. I walked past the showers and put my personal items in the locker. I couldn’t believe my luck. 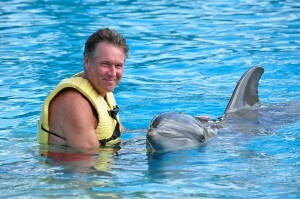 I was finally going to swim with dolphins in Riviera Maya. We were broken into a group of seven with one trainer leading the way. He walked us to the dolphin facility and explained some ground rules. It was then time to enter the water. The dolphin facility was larger than I expected. There seemed to be so many dolphins swimming around freely, jumping, playing with a ball and communicating. It is a surreal moment when you enter the water with them. You’re excited, eager, and curious. You’re not anxious, the way you would be if there were sharks, but you are aware and respectful of the fact you are entering someone’s home. And that someone is special and sentient. In our last article, we mentioned how the latest scientific studies have confirmed the presence of “Von Economo neurons” in dolphin brains. These specialized neurons are responsible for “emotions, social cognition and even theory of mind—the ability to sense what others are thinking”. Once in the water, Juan, our dolphin trainer introduced us to his dolphin. He said “his dolphin” because each trainer only works with one dolphin, for the most part. This helps form a strong cohesive bond with each trainer, he explained. He gave us a brief breakdown of their size and diet. On average, dolphins weigh about 440 to 550 lbs. will eat between 2 lbs. to 55 lbs. of fish every day, said Juan. They eat a two different kinds of fish and squids. One fish is for nutritional value, the other is more fatty and delicious. You can guess which the dolphins prefer. The squid, as I was surprised to learn is part of their diet, for hydration, not caloric intake. As Juan taught us, dolphins do not drink water. They live in salty, saline ocean water. That means they have to extract hydration from food. Juan also commented that dolphins live about 20-25 years older in human care than they do in the wild. However, he admitted, some of that had to do with human-caused pollution and environmental destruction. The rest had to do with the fact that they had a guaranteed steady stream of a well-balanced diet. They also had regular access to veterinary physicians and medicine. And finally, they had protection against any predators. After hearing my name called, I realized it was my turn for the highly anticipated foot push! I was instructed to swim to the middle of the swimming area. Then lay stomach down, with toes pointing downwards. The toes were the key as the dolphins would, after receiving a visual hand signal from Juan, push their bottlenose against your foot and propel you forward, and upward. What an exhilarating feeling it is to work in tandem with a dolphin to perform, what looks like a circus trick—all on the first try too! After everyone got a chance at the foot-push we went back to the lounge. There we watched a brief documentary that detailed their dolphin conservation efforts with Universidad Autónoma del Carmen. They were able to perform a health evaluation at Campeche, Mexico, where a dense population of bottlenose dolphins. I was impressed with their commitment to conservation goes beyond just talking about it. They actually take an active role. 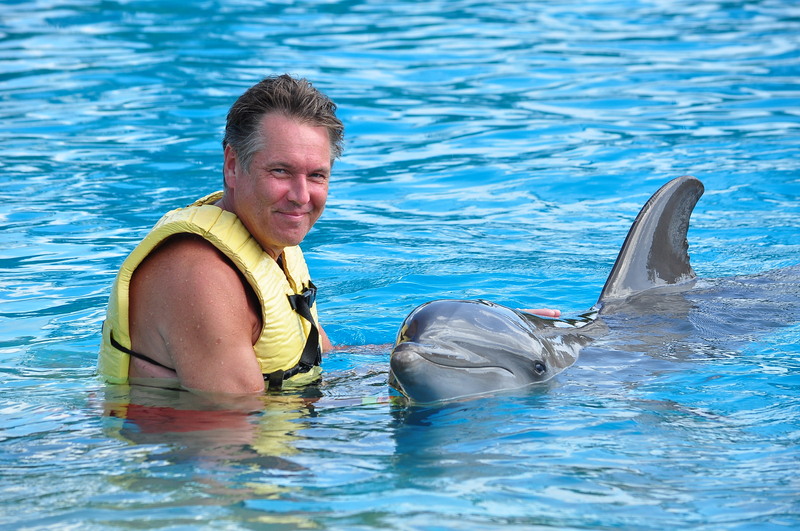 I got the once-in-a-lifetime opportunity to swim with Dolphins in Riviera Maya at Dolphinaris. Don’t forget to check out next week’s article, where we finish my day as a dolphin trainer for a day at Dolphinaris Riviera Maya. ¿Cómo disfrutar de Semana Santa sin estresarte en el intento?